Almost every time I go to Highland, my first stop is the book section. I love the books for a couple of reasons, one of which is budgetary. I have almost all the moderately priced tools in the store, so the books offer a chance for a little vicarious woodworking at a moderate price. Last time I was there I bought a neat little book originally published in 1937 — “The Village Carpenter” by Walter Rose. He writes about woodworking in England in the Victorian period when his father ran a woodworking business. 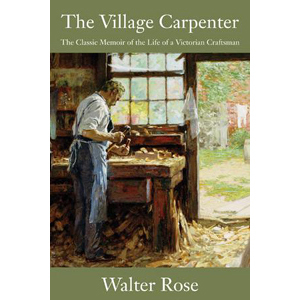 In the introduction they talk about carpenters: “… a child can watch a carpenter at work without risk of soiling; sawdust is cleaner than snow and not unlike it, and the long curling crinkled shavings, that come off sweetly (as clean as a whistle) are lovelier than any manufactured fabric. Wood is tender stuff, too; you must not bang it about as you bang iron about, and, handling it gently, carpenters as a race are gentle. They seldom shout; they never leave their tools about.” I like that. It’s a lovely little book, talking about times gone by in England. But something hit me when I started reading it and particularly when I got to the chapter on Undertaking. Let me explain. My Great Grandfather John Nathan Chapman was a carpenter and woodworker and he made wagons and buggies in the backyard of my Grandmother’s house. He was born in 1847 and lived until 1922, so his career spanned the era that Mr. Rose wrote about. That would have been only a few generations removed from the family migrating from England/Ireland, so you know some of his traditions and tools had to come from the old country. People don’t invent new tools and methods of work and traditions just because they go for a little sail. Here’s his picture in front of the shop. I’m looking at the wheel rims, and the wheel blanks and the buggy shafts and I love that apron he is wearing. He would recognize all the tools in my shop if he walked in today, and I bet he would really love my table saw and the electric bandsaw. I have this fantasy that one of his buggies or wagons is still out there somewhere. How I would love to have one of them. I do have a nameplate from the “Crawfordville Furniture and Buggy Shop”. But back to the Undertaker chapter. My family has been in the funeral business for a long time and the family story is that it came from the carpentry shop in the back yard. 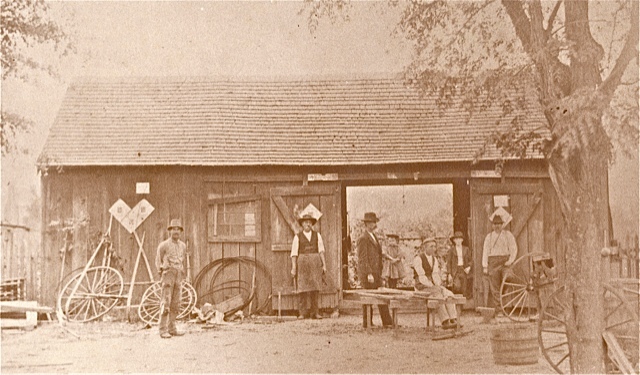 As explained in the book, it was a standard part of the carpentry business. After all, if not the carpenter, then who else would make a casket? Making coffins evolved into the funeral business. My Grandmother, a widow with three small children in the Reconstruction South, needed an income and continued doing funerals with her two sons, one of whom continued until his death a few years ago. I remember when my brother or I spent the night at Grandma’s, it was not unusual for there to be a body lying in state in the room next to the bedroom. In fact, we often asked permission to go in for a private viewing before going to sleep. The room at the top of the stairs was where the coffins were displayed for sale and we loved to play in the coffin house next door. I really related to this little book and it is one of hundreds available for sale at Highland. They can’t list them all in the catalog, but look on the web site and there are at least 830 shown there. If you don’t see what you want, call and ask. They’re here to help.